Scottie Lindsey cruises in for a layup. The senior guard had a career-high 32 points in Sunday’s loss to Iowa. Northwestern may have walked into Carver Hawkeye Arena locked into the No. 10 seed in the Big Ten Tournament, but the Wildcats were anything but locked in defensively in their 77-70 loss to Iowa. The visitors were playing without junior forward Vic Law, who missed the game with a foot injury, and spent most of the evening without senior guard Bryant McIntosh, who played only seven first half minutes, and senior forward Gavin Skelly, who played eight. NU (15-17, 6-12 Big Ten) allowed 45 points in the first half, the most points the Cats have allowed in a half since they gave up 68 in the opening frame against star guard Trae Young and Oklahoma back in December. Guard Jordan Bohannon led the Hawkeyes (13-18, 4-14) with 25 points, 20 of them coming in the first half, and shot 7-for-14 from the field. All 14 of Bohannon’s shot attempts were 3-pointers. Bohannon, however, wasn’t even the leading scorer in the game due to a magnificent performance from senior guard Scottie Lindsey. Lindsey put up a career-high 32 points on 10-for-14 shooting while making nine of his 11 3-point attempts. Twenty-one of those points came in the second half, as McIntosh and Skelly sat. Lindsey’s 32, however, weren’t enough for NU to overcome a mess of an offensive performance otherwise. Other than Lindsey, the Cats shot 39 percent from the field. Sophomore guard Isiah Brown and freshman guard Anthony Gaines were asked to do more offensively and they struggled to generate consistent offense, shooting 7-for-25 while committing five turnovers. Gaines played the entire game, while Brown played a season-high 33 minutes. Collins said McIntosh’s injury was too serious for him to continue to play Sunday. Those depth issues cause Collins to turn to some new lineups — at one point even inserting walk-on redshirt freshman Tino Malnati into the game in the first half. Centers Dererk Pardon and Barret Benson, who usually split time at the position, shared the court for much of the second half. 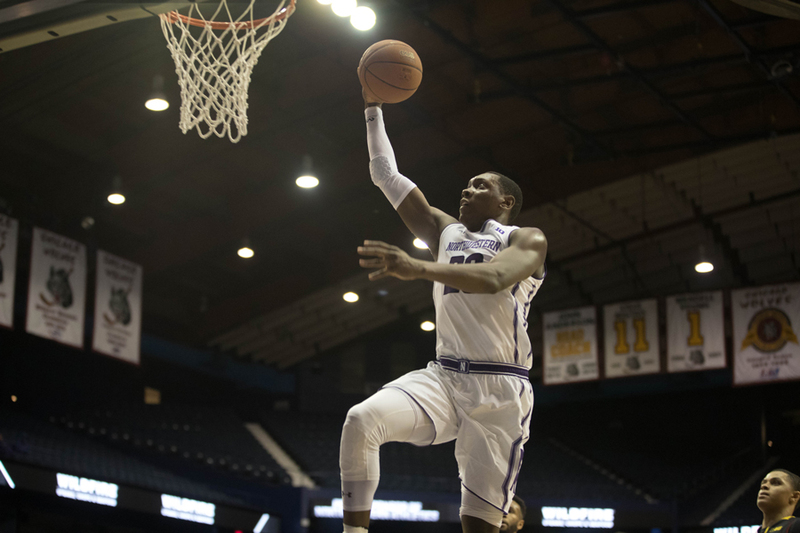 The loss was NU’s sixth-straight as the team has been in free fall since losing at Maryland earlier this month. While the Cats haven’t been playing well of late, Collins was happy with their effort to rally in the second half.